Shown off at Computex 2015 in Taipei June 3, the Cubic Live camera from Taiwan's Altek can stream live video to YouTube. 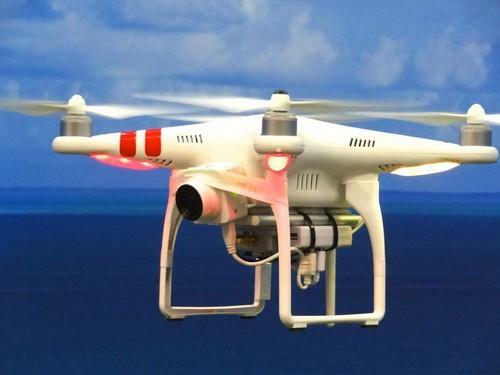 Seen here aboard a DJI drone, it will be priced around US$130. The cause of the explosions was still unknown, but some of the most striking scenes were recorded by drones flying overhead. Footage shows a large area of the city covered with smoke from multiple fires, as well as crumpled buildings and piles of smashed shipping containers. The bird's-eye views are a reminder that drones are increasingly present when disasters strike. Their use has attracted criticism, particularly when amateurs interfere with relief and rescue efforts, but they can also be a valuable tool for gathering information. "Drones are being used in disaster zones to survey damage and, in some cases, search for survivors," Andrew Amato, editor of the website Dronelife, said via email. "In most cases, it is much safer to send a flying robot into a disaster zone because the devastated terrain could easily create additional danger for on-foot rescue crews." Some of the drones in Tianjin appeared to have been dispatched by news crews, and there was no obvious sign they had hampered operations on the ground. Use of the technology, though, has raised a host of issues about where and how drones should be used. Skycatch, a startup that specializes in data capture using unmanned aerial vehicles (UAVs), deployed drones and pilots to Nepal following the massive earthquake that hit there in April. They were used to construct 3D maps of hospitals and schools, as well as UNESCO World Heritage sites, to help assess damage and plan reconstruction. "Disaster zones are often unpredictable -- buildings are unstable, weather patterns are ominous, debris is still falling, and people are suffering -- it's easy to divert from following safety procedures and protocol in the midst of chaos and eagerness to help, but you must build an extra margin of safety and operate accordingly," Eugene Kwak, director of product, hardware platform, at Skycatch said via email. "Amid all the chaos, it is easy to get caught up in the excitement of wanting to help, which can get you in trouble if you do not have the proper authority to fly." That's been an issue in California lately, after drones used for photography interfered with efforts to battle wildfires near Los Angeles. State legislators have proposed using jamming technology to disable drones that get in the way of first responders, as well as jail time and stiffer fines for offenders. Other events have inspired the use of drones to help people in need. The Humanitarian UAV Network was formed after Typhoon Haiyan devastated the Philippines in November 2013. Hundreds of drone pilots in over 60 countries are able to help the network capture aerial imagery faster than satellites can, identify badly hit buildings and useable roads, and put the information in the hands of disaster-response managers. Drones are also playing a role in more unusual and terrifying crises like the nuclear emergency at Japan's Fukushima Dai-ichi power plant, which went through a meltdown in 2011. A spinoff of Chiba University is preparing to mass-produce a high-end hexacopter that will undertake radiation surveys of the crippled complex to aid cleanup crews. Work to dismantle the power plant will take decades.